Would you love to work closely with the Blacklight Slide? Do you want to receive $25 worth of free Blacklight Slide Merchandise when you are done? 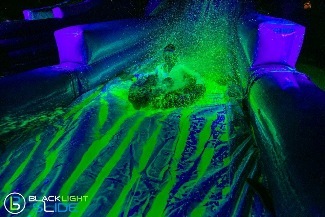 Do you want to both be a part of the Blacklight Slide experience while also making it better for participants? Did you answer 'yes' to any of these questions? We thought so. We want you to volunteer to work with the Blacklight Slide! Sign-up for a city near you! Blacklight Slide welcomes volunteers age 16 and older. If the volunteers are below the age of 18, they MUST have an adult supervisor (parent, teacher, guardian, or club director). No volunteers under age 16 are allowed, for safety and logistics. * If you are volunteering to complete community service hours, we require that you bring a form that is to be signed by the Blacklight Slide supervisor at the time you volunteer. Collecting waivers, checking IDs, checking for completion of registration, distributing wristbands, handing out tubes or working in the Glow Store. You will receive a FREE Slide entry for your support. Help our participants with purchasing cool glow gear to make their night even more fun! Our sliders need their tubes! You will help with inflation and distribution of tubes to the participants. Help guide our sliders in the Slide experience. Volunteers will be trained for this position on site. I have volunteered in to pass. Crowd control and assist our DJ in providing a fun experience. I'm deaf. I used it filler air tube 2 or 3 year ago. Then one year ago I used attention help slide safe. I love it help it. But I'm never seen before DJ party near security front of crowds. Cant wait to volunteer again!